The AGBU’s first European branch, founded in Manchester in 1909. 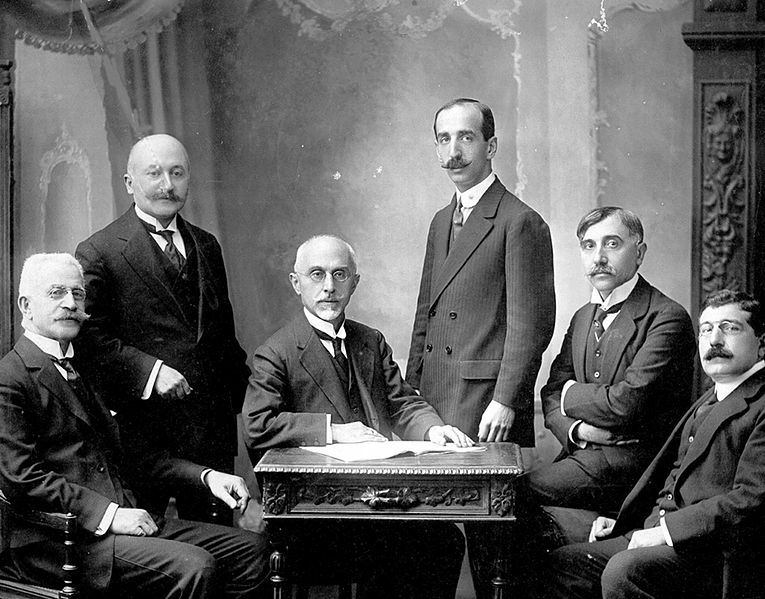 From left to right: Sarkis Kuyumjian, S. Shnorhavorian, Mihran Manukian (president), M. Bakrjian, K. Funduklian, D. Iplikjian. The Armenian General Benevolent Union (AGBU) was founded on April 15, 1906, in Cairo, Egypt, by the initiative of renowned national figure Boghos Nubar and other prominent representatives of Egyptian-Armenian community to contribute to the spiritual and cultural development of the Armenian people. The goal was to establish a union that would in every way assist the Armenian people, the future of which, as a minority in the Ottoman Empire, was endangered. In 1906-1912 the AGBU provided the villagers of the Western Armenia with seeds, agricultural instruments, etc. It established schools and orphanages in Western Armenia, Cilicia and other Armenian-populated regions of the Ottoman Empire. In 1914 AGBU had 142 branches in Western Armenia, Cilicia, USA, Argentina, Europe and Africa with 8533 members. The WWI years and the Armenian Genocide were a turning point both for the Armenian nation and the AGBU. In 1914 Boghos Nubar left Egypt and moved to Paris. Despite the huge losses in different chapters of the union, the AGBU managed to render tangible help to the Genocide survivors. 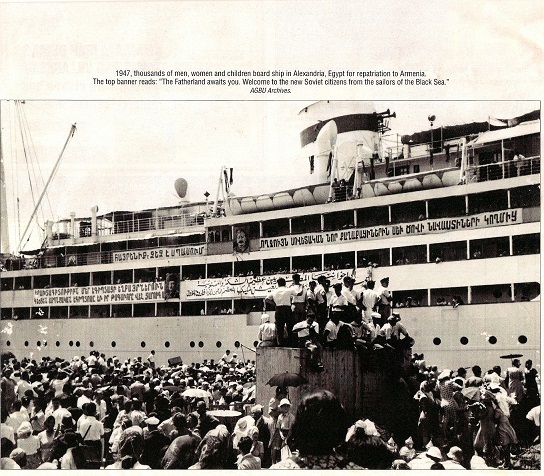 In October 1915, the Sisvan school with 1222 students, later an orphanage and a camp for women refugees were established by the AGBU in the desert near Port Said, Egypt, where the camp of the survived people of Musa Dagh was settled. 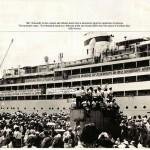 In the years following the Genocide the AGBU was mainly involved in taking care of orphans. After the war the AGBU was reformed and founded new branches in Armenian-populated regions of the Near East, Greece, France and USA. In 1921 the union’s headquarter was moved from Cairo to Paris. After the World War I the main goal of the AGBU was to preserve and promote Armenian language, identity and heritage through educational, cultural and humanitarian programs. In 1926, AGBU established the Melkonian Educational Institution in Nicosia, Cyprus, Nubarian foundation, which provided scholarships to Armenian youngsters to study in European universities, and the Marie Nubar Dormitory in Paris in 1930. 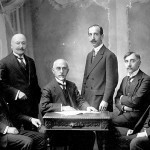 In 1930 after the death of Boghos Nubar, oil magnate and another prominent Armenian figure Galust Gyulbenkian takes over the presidency of AGBU. After heading the union for two years, his son, Zareh Bey Nubar, came to replace him in that position and headed the union until 1940. During the World War II the AGBU headquarters was moved from Paris to New York. In 1942, Arshak Karagyozian became the fourth president of the AGBU. The AGBU activities aimed at national preservation became more effective in post-war period, especially during Alex Manoogian’s tenure (1953-1989). AGBU expands and becomes the biggest and most influential Diaspora-Armenian organization in the world. In 1954 Alex Manoogian founded ՚՚”Alex and Marie Manoogian” and in 1968 “Alex Manoogian” cultural funds, through which a number of educational and other establishments were built in the next several years. Today, AGBU has chapters in 80 cities of 22 countries of the world, with 22,000 members, 120 branches, 27 cultural centers spread worldwide in USA, Europe, Near East, South America, Australia. AGBU has 20 schools (6600 students) and finances more than 16 educational establishments. In Paris and New York the AGBU has two libraries. In 1989, Louise Manoogian Simone, daughter of Alex Manoogian, became the president of the AGBU. It gave a new breath to the strengthening of ties between the Armenians of Armenia and Diaspora. In 1988, immediately after the Spitak earthquake, AGBU organized transportation of food, clothes, and medicine to the disaster zone. In 1990 AGBU opened a representation in Yerevan. Restarting its activities in Armenia after a 50-year interval, along with humanitarian assistance, the AGBU carries out projects aimed and contributing to the development of the country. In 1995 AGBU founded “Young Professionals” (YP) organization in Los Angeles. More than 500 graduates of US, Canadian and European universities are members of this organization. Today, there are 17 YP groups in 11 countries of the world, among which the newly-established AGBU YP Yerevan group (2007). Since 2002 Berge Setrakian is the president of AGBU. Having been an active member of AGBU structures since early youth, today he continues this patriotic mission, which started a century ago.